Being(s) in Love By R. Cooper Book Review Published by Dreamspinner Press Impressions To be a brilliant spinner of tales an author must have an awareness of animal spirits. The reality of that shifting paradigm is present when an author makes compelling characters that weaves a tale. It touches the libido – it drives all we consciously do. I decided to read this compilation of novels by R. Cooper’s “Being in Love” not understanding how real he makes the unknown…knowable until it becomes familiar. He woos with tales of beings of a certain kind. 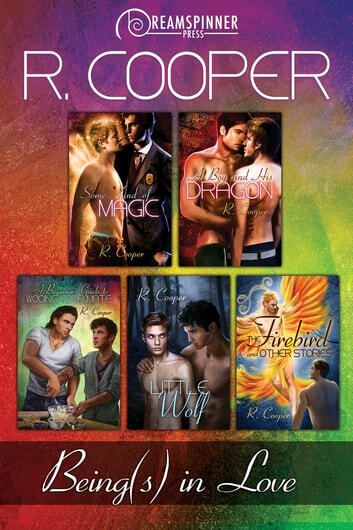 R. Cooper’s collection of his Beings series grapples with the sensual world of mystic beasts of fable living amongst humans. To me, the most compelling story is Little Wolf. Sensual and captivating this collection of novels presents beautifully the many twist, turns, and roadblocks to achieving what the heart and body craves most even between Being and man. Story/Plot/Conflict Some Kind of Magic Calla lily (Cal) Parker, a young beautiful half fairy, and Ray Branigan a werewolf detective find that resisting their Beings instincts conflicts with their growing love. Working together in ferreting out a serial killer in a big city is difficult they passions overrule. The hot young half faery was not what a seasoned werewolf detective expected. A Boy and His Dragon For History student Arthur (pet) MacArthur and the dragon lecturer historian Dr. Filbert (Bertie) Jones, it was love at first sight. Unfortunately even only Bertie understood that. An orphaned starving student struggling to care for a younger troubled sister hopes this new job as assistant to the dragon professor Bertie will be the answer to his financial woes. Thing is he was unprepared for the dragon shift to human form as a very hot and beautiful male. Arthur fears losing his dream job while realizing that he has fallen in love with his romantic dragon employer. They begin a beautiful dance of want and abstinence…the virginal young male and the beautiful were dragon overwhelmed with newly found love. A Beginner’s Guide to Wooing Your Mate Puberty and the lack of understanding about werewolf mating caused human magic wizard Zeki Janowitz and werewolf Theo Greenleaf to lose the opportunity to discover their mutual love in high school. Reuniting years later its Theo’s yearning for Zeki that transforms his baking into something magical. Beautiful Theo’s brownies find there ways with Zeki’s heart and body. Little Wolf Beautiful and powerful werewolf Sheriff Nathaniel Neri (Nate, Big Wolf) and his newly discovered “mate” the young runaway heir Timothy Dirus (Little Wolf) must first understand how to cope with overwhelming emotions of love and need for each other, before confronting and defeating the threats that drove the young heir to become a runaway. Nate has waited his entire lifetime for a mate. But he never dreamt that the promise of love lies in the arms of a scrawny belligerent post pubescent little wolf. They both fight to overcome their disparate lives that threaten to return Little Wolf to his captor uncle. Will Wolf’s Paws, locals, and visitors see Nate capture the heart of his fated “mate” and will the wild young little wolf Tim learn to trust that love. The Firebird and other stories A wonderful sensual stew of other how beings came to be part of and on love with humanity, from were-cats to the last of the Firebirds, in time their isolation ended. Critiques I wanted to add the advice for editing because of choices in phraseology. But in hindsight it may only interfere with the cadence of the works…which is pitch perfect. Again Ms. Cooper has not let me down. A great collection of stories and happy endings. I especially enjoyed A Boy and His Dragon and the last story a continuation and very happy ending.